Wow.For my first foray into graphic novels, I'd say I lucked out. I always loved Ender's Game (the original book), but this was an excellent adaptation.The illustrations were superb, and the story told quite well for only scenes and dialogue. Especially considering so much of the book happens within Ender's head. This gives me hope for the movie they're planning.Would I recommend this if you've never read Ender's Game? Absolutely not. Go read the book first, it's a classic.If you have read it, and you loved it, check out this adaptation—you won't be disappointed. Let me start off by saying that Ender's Game is one of my favorite books of all time, so I knew that the story of this graphic novel interpretation would be good. Overall, the whole thing was exactly what I'd come to expect.Two issues though: 1) The art. While it is cool to see a different imagining of the story, the biggest problem I had was with the faces. The kids look too similar and are hard to tell apart. 2) The end. I won't ruin it here, since I think the Final Exam is an amazing part, but they left out the scene with Ender and the Queen... I'll say no more. I've always thought that scene was very important to showing the "peace-loving" side of Ender.Overall good read and I recommend, but read the book if you like this graphic novel. Ender's Game is the third best piece of sci-fi/fantasy ever written according to NPR's Top 100 Survey that had 60,000 people voting. I freakin' loved this book. I'm a sucker for child soldiers. Ender's Shadow was sweet (It's about Bean) and Speaker for the Dead was pretty good too. Child soldiers...it's what we're training kids for with video games anyhow. Who needs robots if you have remote controlled drones? I Inter-Library Loaned this book to see how well the book was put together and whether the content would be good for our library. Since the book has been made into a movie everyone has wanted to get their hands on the book. I have listened to the audio book version of the novel.I must say that the graphic novel (the Ultimate Collection of 10 comics) was quite good and followed the story line very well. The artwork was very colorful and also followed my personal vision. I was very comfortable with the story and believe that it is a great supplement to the novel.Because of the nature of the material this graphic novel is more geared toward teens and adults just as the original novel. Overall I liked the visual depiction, it's been so long since i read the original novel I can only assume it matches it as imagined by Mr. Card. I'm not too sure about how this book wrapped up the last couple of pages, might just have to go back and re-read the novel.Would certainly like to see the remainder of the series adapted to this format, especially Speaker for the Dead - my personal favorite that perhaps sparked a rexamination of all my preceptions and preconceptions on the value of war; although I certainly didn't fully realize it at the time. I wouldn't recommend reading this before you read the book Ender's Game, since the story and the characters will make a lot more sense and have a bigger impact that way.I really liked the art in this one, although I found it somewhat difficult to distinguish between the characters at times. I would have also preferred it, if they had stuck with the original ending instead of cutting it short. The ending in the book actually plays quite an important part of the overall story (at least in my opinion) and especially regarding Ender's character growth. 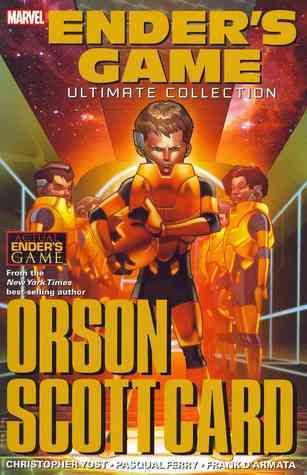 This trade paperback includes all 10 issues of the comic book adaptation of the novel Ender's Game. These issues were previously collected in two hardback volumes: Ender's Game: Battle School (issues #1-5) and Ender's Game: Command School (issues #6-10).Like most graphic adaptations of Card's novels, this was enjoyable for its visual representations of an exciting story, but the true beauty of Card's writing--the interplay of several characters with sophisticated motivations--doesn't translate very well into this medium. An okay adaptation of Ender's Game, but too much of the main characters inner monologue was left out and much meaning was lost from the story. The art was clean, but none of the characters were very distinctive. I did like the the design of the technology for the most part...but overall I feel my imagination created better visuals when I read the original novel. I never read comic books but I liked Ender's Game so much that I bought this when I was browsing a local comic book store. I had no idea how much I would enjoy reading this collection. The artwork is absolutely stunning. The major downside is that much of the story is lost in the conversion to a comic book. I don't recommend reading this instead of the novel. It's best read as a supplement after. It's been a while since I'd read Ender's Game. I'd heard that this was what convinced Orson Scott Card to allow the book to be made into a movie, so I thought I'd take a look. The graphic novel was definitely more graphic. Still love the story. This didn't develop the relationships as much which is part of what I loved about the book, but this is about visual. They did a pretty good job of adapting these to comic book form. The only one that I was less than pleased with was the Formic Wars, and that may just be because I read the actual book so soon before hand that the errors and omissions were glaringly obvious to me. Awesome collection of the Ender's Game graphic novels. I couldn't get through this one. It was just a poor adaptation of the novel. Read the book and skip this. All of the nuance is missing. not nearly as good as the book....had the general story though. Good companion to the books. OSC marathon continues. This captures all the essential details of the original novel and is a much more complete view of Ender's education than was portrayed in the film. An amazingly good read! Best YA book I've read in years. Very sympathetic characters and lovely depiction of the complexities of sibling relationships.